A follow-up meeting on Waste Management was held on 1st July,2018 at 4.30 pm in TMAM Research and Orientation Centre Auditorium. Mrs. Sheeba Biju, Panchayat member presided over the meeting. Dr Jacob George, President, Green Fraternity, an NGO started with an aim to rejuvenate the Meenanthara river gave a talk on “Plastic and Water Pollution “. Water is the most precious thing not only on Earth but in the whole universe. Aren’t we happy to find traces of water on the moon or some other distant planet? Then, why is it that we are ignorant and irresponsible about our rivers and lakes. How are we responsible for the pitiable plight of our rivers and lakes? Any unmanaged waste that is thoughtlessly thrown away ends up in water- either in the rivers or in the oceans. The biodegradable wastes decay. The plastics slowly degrade due to salt, water or sunlight and fall apart into tiny, microscopic pieces. This particulate matter is absorbed by small fishes or creatures and find its way up the food chain, affecting each organism along the way with dangerous consequences. So, plastic waste should never be allowed to reach any water sources. 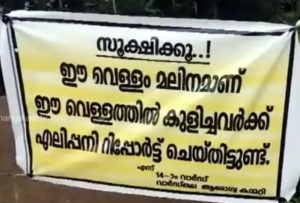 Meenanthara river, a tributary of the Meenachil river that flows through Kottayam was on the verge of collapse due to wastes, pollutants and illegal encroachments. The river once had flowing crystal clear water and served as an ideal abode and breeding place for many varieties of fishes. The river ceased to flow and was reduced to just a trickle of black greasy water over the years. Fishes were gone, and epidemics loomed over the people who lived near the river and two youths who got into the river were affected with rat fever. Despite complaints to the authorities to clean up the river, the only action taken was to put up a board warning people to be careful about contracting diseases. No fund was available for cleaning up the river and restoring it back to life. Dr Jacob George decided to take up this responsibility and Green Fraternity, a voluntary organisation for the revival of the Meenanthara river was formed in July 2017 and 5 youths volunteered to help. It took the team 14 continuous days to clean up the river and restore its flow. This initiative of the Green Fraternity has paved the way for relinking the Meenachil-Meenanthara-Kodoor rivers and restoring these rivers back to life. Hopefully many more rivers are rejuvenated back to life and the ecological balance is maintained for the benefit of our future generations. Remember, water is instrumental to sustaining life on earth. Non-biodegradable Waste Collection based on the guidelines provided will be facilitated at the centre in the 1st week of August 2018. If at least one item in a pack is found, not confirming to the set standards in the guidelines of waste collection, the entire pack will be discarded.